I’m currently working on a small-scale project for a client which is based on increasing their visibility through social media and syndication. 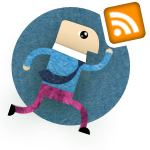 In short, I’m linking their RSS feeds with Twitter, and providing an increased number of ways to access their existing content. A side-effect of this is the possibility of monetising their currently naked RSS feeds through the use of FeedBurner’s AdSense integration (thanks to Google’s acquisition of the service).